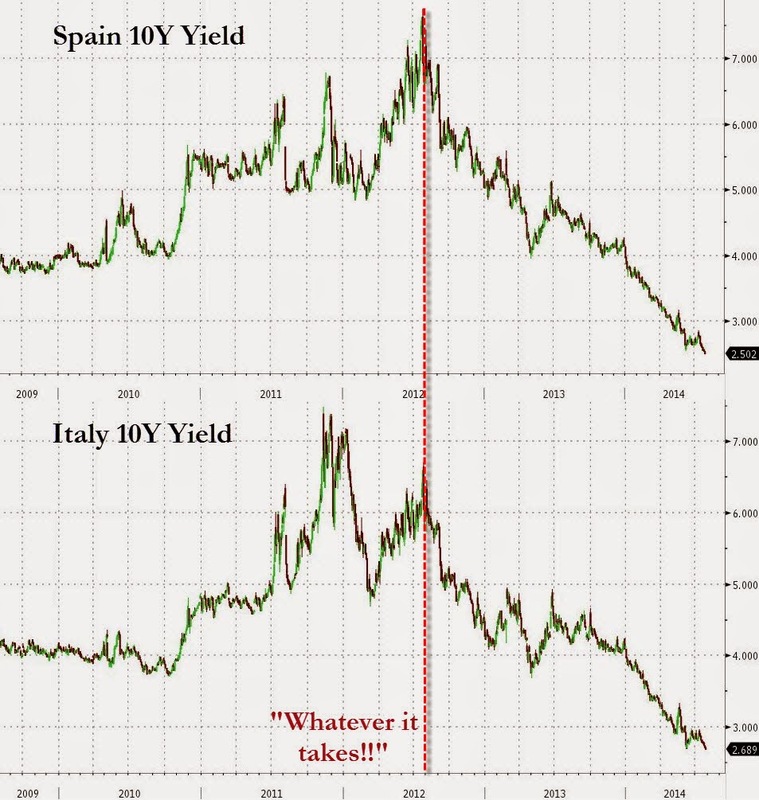 As we have covered numerous times, the ECB's "whatever it takes" was the green light for the banks located within the PIGS (Portugal, Italy, Greece, Spain) to begin buying as much toxic government debt as possible. They knew if yields were to rise in the future they had a central bank standing ready to print and purchase the toxic bonds to bail them out. This process also took away any pressure on governments to create structural reforms within their economies (spending cuts). The chart below shows the steady rise of government debt to GDP for the PIGS since 2010. In other words; as prices of European government bonds have risen to all time highs, the quality of the debt has fallen to all time lows. 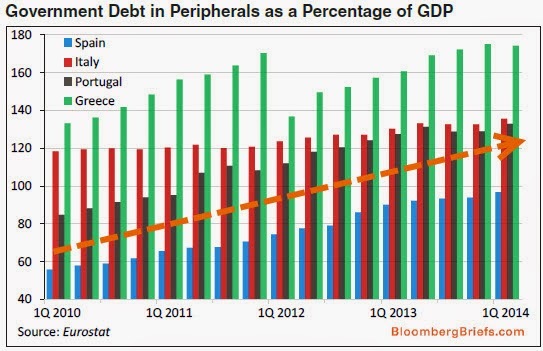 The sharp drop off in Greece government debt to GDP back in 2012 (green lines) was due to their partial debt default. In reality, the situation is far worse than the chart above shows because of the enormous debt now resting on the bank's balance sheets which have a conditional guarantee from the governments (think Fannie Mae and Freddie Mac). Does this all sound insane? It's because it is. Looking beyond the debt markets, the equity markets in Europe have also grown far more dangerous over the past two years. 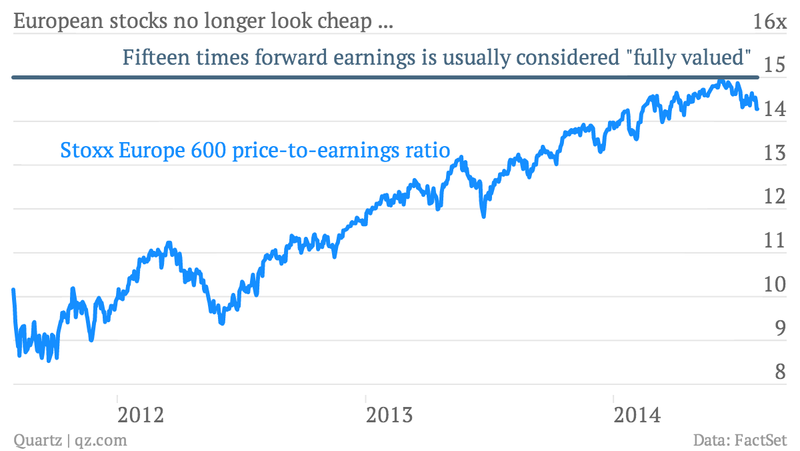 Share prices have risen from undervalued levels on a price to earnings basis in 2011 to a "fully valued" point today. The euro currency is also coming off of a multi-year rise setting up trouble around every corner for a massively overvalued and euphoric set of markets in the European Union. Thanks for your continued efforts. Your crystallizations are very valuable, and I'm sure that there are many readers of your blog who benefit from them.